Store-bought products contain chemicals that are both harmful to the environment and our bodies. One reason is the substances that are used in industrial products are not biodegradable or only very slow. This means that they stay in the water for a very long time, contaminate soils and eventually kill the flora and fauna. To fight this, we’ve been working on entirely natural recipes! It is particularly important here at L’Ane Vert as we filter and reuse all of our water for our garden. Indeed, chemical products also kill the good bacteria that is essential to filtering our water in our water-epuration system. One way to solve the problem is to use baking soda as a key ingredient as it has an adverse effect neither on the aquatic ecosystem nor on consumers. So after trying dozens of combinations and adjusting proportions, we now have our very own 100% natural cleaning products and cosmetics! Here are the recipes for you to try at home as well! Pour some orange and lime peels in white vinegar in a jar or big plastic bottle, and let it marinate for a couple of weeks. Your all-purpose cleaner is now ready to use everywhere at home, from kitchen sinks and windows to bathrooms and counters. Tip: it’s an excellent way to easily remove wax stains as well! Mix the hot water, black soap and lime juice together. It helps using a whisk to dissolve the soap. Add the baking soda slowly and mix well. Let it cool, mix some more and finally add the essential oils. Dissolve 100g of black soap in 1L of boiling hot water. Add 2 tbsp of baking soda. Mix well. When it’s cooled down, add 15 drops of lavender essential oil. This will depend on what your floors are made of. Using a 70% white vinegar and 30% water mix with 30 drops of tea tree essential oil works really well on hard surfaces such as tiles. If you have wooden floors, diluting a bit of black soap in warm water will do the job, without even having to rinse it! Mix 100g of sea salt together with 50g of olive oil and 5 cl of argan oil. 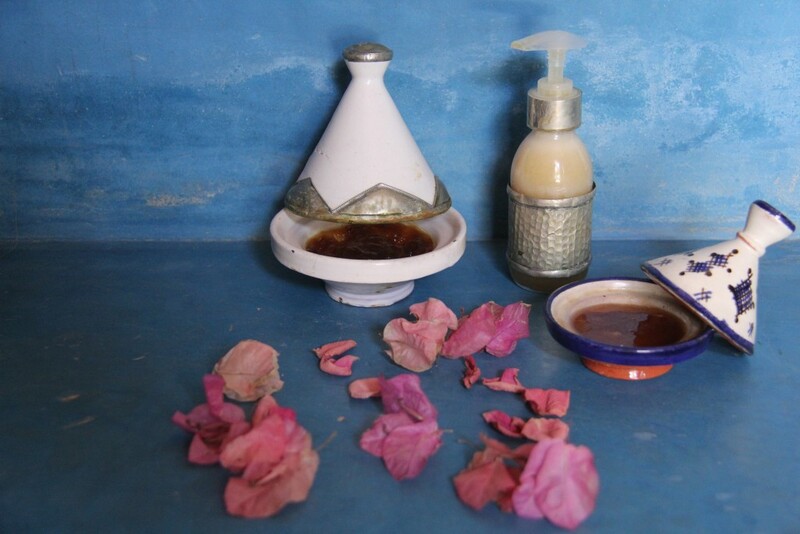 Pour a few drops of geranium essential oil and you just made yourself a Moroccan scrub! Dissolve some black soap with hot water until you reach a nice, thick consistency. Finish up by adding some drops of your favourite essential oil if you wish.